WHAT IS A BLANES WEBCAM OR BLANES WEB CAM? Blanes webcam or Blanes web cam are digital cameras directly connected to the Internet. Some people also refer to these web camera as web cam Blanes cams. Blanes is a popular tourist resort on the Costa Brava. Blanes tends to be more relaxed and less crowded than its better-known neighbours, Tossa de Mar and Lloret de Mar. 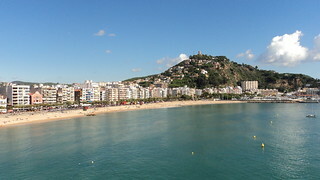 Blanes has four kilometres of sandy beaches, and boasts an old town of medieval houses, fountains and Gothic churches. Blanes still remains a working fishing town – one of the resort’s top attractions is the lively fish auction which is held every evening in the harbour. To get around use our Blanes map. Blanes travel and weather webcams are constantly transmitting and streaming live video, pictures and images of Blanes that you can see from your computer wherever you are in the world. For more tourist information see our main Blanes tourism page. Please help us by suggesting any Blanes webcams that you know of in order to build our list of webcams in Blanes. Blanes Webcams – Page Summary – This page contains links to webcams in the town of Blanes as well as videos of Blanes. We show you Blanes webcams so people who have never been can see what Blanes looks like.